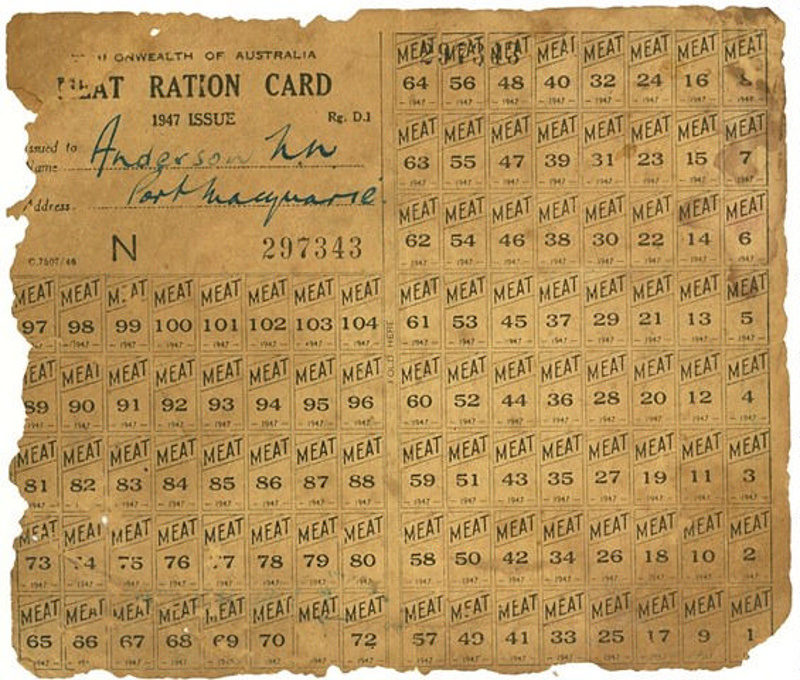 This meat ration card printed on cream coloured paper in black ink with attached numbered coupons was issued to Neville Andrew Anderson [1908-1999] of Port Macquarie by the Deputy Director of Rationing, Sydney for the Commonwealth of Australia. Rationing was introduced in Australia during World War 2 to manage shortages and control civilian consumption, reduce consumer spending, limit anticipated shortages of essential goods and ensure equitable distribution of food and clothing. It was also hoped that a cut in spending would lead to increased savings and investment in war loans. Rationing regulations for food and clothing were gazetted on 14 May 1942. Rationing was enforced through the issue and use of coupons, like these ones, and was limited to clothing, tea, sugar, butter and meat. Rationing was administered by the Rationing Commission with coupons surrendered before rationed goods could be supplied. This occurred between traders, including retailers, wholesalers and producers, as well as consumers. Prior to rationing, meat supplies at Port Macquarie were a problem during holiday times with restrictions on the killing of meat. Local butchers did not always have enough meat to go around, and in late 1943 with an influx of visitors it was a case of ‘…feeding the visitors meat and letting the locals go without…’. Meat rationing introduced early the following year was intended to provide a more equitable distribution. Meat rationing was gazetted on 14 January 1944 and abolished on 24 June 1948. The initial meat rations for an adult were 2 ¼ lbs per week, however these were adjusted or reduced at times. For example, in May 1945 the adult meat ration was cut by 12 ½ per cent and supplies to hotels and cafes cut by 25 per cent. Coupons also had expiry dates, although they were not printed on the actual coupons. The Port Macquarie News regularly printed coupon expiry dates as a reminder for its readers. Neville Anderson was a butcher, so it seems he was able to supply meat to himself without the use of his ration coupons. During 1947, fines and expenses amounting to £480/12/0 were imposed on Port Macquarie businesses for breaches of the Prices Act at a Special Prices Court held on Wednesday 12 March. The breaches all related to incidents in 1946. Whilst all those charged pleaded guilty they claimed it was necessary to charge higher than the set prices as it was impossible for butchers to comply with the regulation price of meat whilst the price of cattle on the hoof and sheep was not fixed. Amongst the seven businesses and butchers fined, was Neville Anderson. He was charged with supplying 3lb 11ozs of corned beef at a price higher than the fixed price on 16 October 1946. Despite explaining that this had been necessary due to the prices he had to pay for cattle and that the alternative was to lose money, Neville Anderson was fined £15, £2/10/0 costs and £1 witness expenses. Neville Anderson, was born at Port Macquarie in 1908. He worked as a butcher both in the family business and in his own business for many years . He died at Port Macquarie in 1999, aged 90 years. Ration cards are a reminder of the economic impacts of war and the resulting restrictions on personal freedom and choice on the home front. This ration card evidences meat rationing during World War 2 and the effects of the war on those who stayed and served at home, although in Neville Anderson's case it seems access to meat supplies was never a problem.